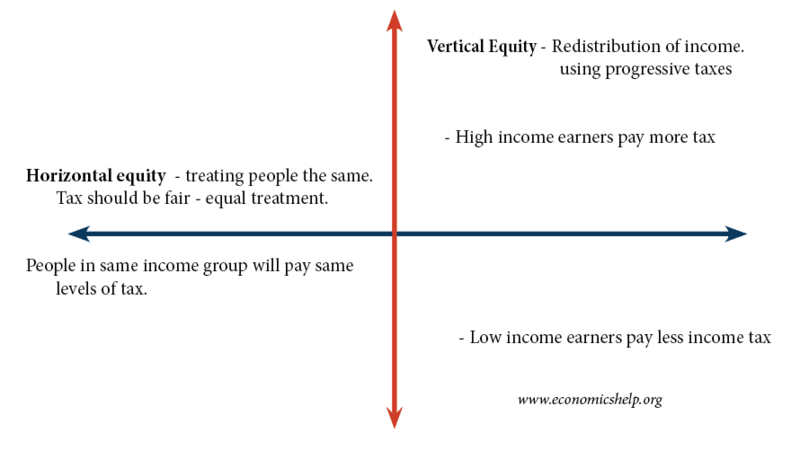 An explanation of the difference between horizontal and vertical equity. Horizontal equity implies that we give the same treatment to people in an identical situation. E.g. if two people earn £15,000 they should both pay the same amount of income tax (e.g. £2,500). Horizontal equity makes sure we don’t have discrimination on the grounds such as race/gender/different types of work. Horizontal equity also requires a tax system which doesn’t give preferential treatment to certain individuals/companies. Horizontal equity is an important starting point for any tax system. Horizontal equity can be consistent with also achieving vertical equity. Horizontal equity is the equal treatment of equals, and this is a means of achieving a distribution of tax burdens that is vertically equitable. The Poll Tax is an example of a tax that has horizontal equity (everyone pays a lump sum of £500 a year). Mrs Thatcher’s theory was that since everyone had the same access to council services everyone should pay the same tax. However, the poll tax does not meet the criteria for vertical equity. For those on low incomes, the poll tax was a high % of their disposable income. For those on high incomes and more ability to pay it was a low %. Complicated tax systems with loopholes can give certain types of individuals/companies preferential tax rates. For example, if you are self-employed, you will pay national insurance contributions. However, if you set up a company and pay yourself dividends – profit. Then in the UK this gets taxed at a lower rate. Company tax is lower than personal tax rates. By switching from self-employment to a limited company, the tax bill is lower. In the US, certain companies can get tax loopholes related to the industry. For example, if a US company sells goods in a foreign country, these sales are not taxes. But, this means some companies can artificially inflate their foreign sales by running inventories through foreign accounts, reducing tax bill compared to companies who don’t side-track profit through foreign companies. Poll tax not horizontal equity, far more unfair than that -broadly people expected to pay same regardless of income. Very straight forward definations. Made it easier for me to grasp the concepts of equity in education. On the same line, how horizontal equity and vertical equity can be applicable to a proposed medal scheme in the Army with that of the existing chakra awards? Yeh thanks…it came to me and I realised more in relation to my papers and the utility of each form of equity placed in types of economics.